Nakd created an edible billboard outside London's Shepherd's Bush Westfield shopping centre this week. 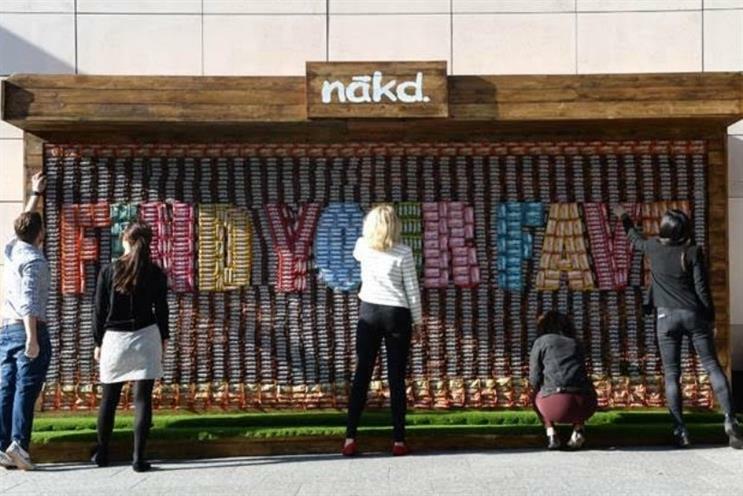 Nakd, the snack brand created by Natural Balance Foods, set up shop outside London's Shepherd's Bush Westfield shopping centre this week with an edible billboard made up of their fruit and nut bars. The aim of the campaign was to showcase the variety of Nakd products available while positioning them as quick, healthy, and convenient snacks. The billboard allowed consumers to taste the different snack products for free and find a snack they liked amongst the options. Across the billboard, snack bars formed the words "Find Your Fave" — a central part of the campaign encouraging consumers to find their favourite flavour. The words also make up the official campaign hashtag. Video footage showing how the brand created the billboard is also being disseminated across Facebook, Twitter, and Instagram to reach audiences on social. Traditional advertising across London as well as in various publications will also accompany the campaign.